We intend to be a completely transparent organisation and we have been showing and talking about our technology with anyone interested since we started. We believe that there is more and faster return on investment in sharing knowledge then in hiding it. Having sprouted from and being part of an open-source community requires that we actively give something back. Therefore, by popular request, Laura has taken the time to document the evolution of our extruder designs. For each iteration we have listed the obstacles we encountered and the improvements we made. When we first had the idea for the project we didn't even know if it would be possible to recycle cups and create filament out of it. That's why we made the most simple extruder imaginable. It consists of a tube with internal threading and a threaded rod that pushes the material through by turning it. For a nozzle we used standard plumbing parts that have a standard compression fit on the tube. We heated the nozzle with a torch. Unfortunately the fit wasn't tight enough and the nozzle came off. + : easy to make. standard parts. The updated design of the test model. Wet material causes bubble forming. We kept the design the same and replaced the nozzle with a nozzle that we turned ourselves on the lathe. With this extruder we were able to create our first filament from old plastic cups and we made our first print with it. We also found out at this stage that the plastic shreds have to be dry to prevent the water from causing bubbles in the filament. We had proven that our concept would work. The next step would be to create an extruder that could extruder material continuously instead of having to reload it by turning back the rod. Extruder control with Arduino and interface. This extruder design was inspired by Bigelow Brook Farm's plastic extruder, meant for creating plant growing beds. At the time, that was one of - if not THE only DIY extruder design that was shared on the internet. We used an 18mm auger and a small DC motor that was controlled by Arduino. For heating we used NiChr 0.5mm wire that we insulated by hand with Kapton tape and coiled around the tube, powering it with an ATX computer power supply. The small DC motor wasn't powerful enough and failed halfway through testing, so we continued testing by hand cranking the auger. This actually worked very well because the torque one is able to deliver by hand can compensate for irregularities in the shredded plastic input. 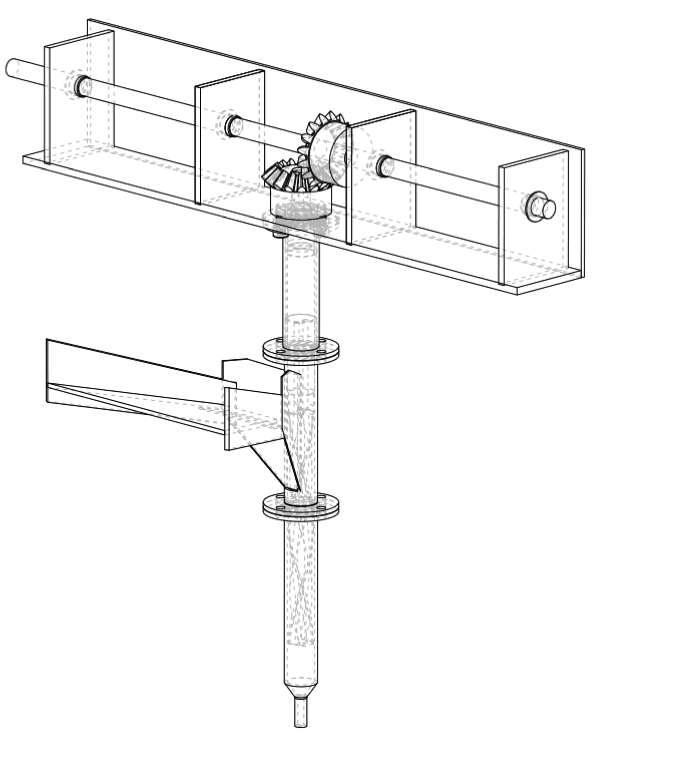 Design of the vertical extuder. The first extruder to be integrated in the installation. For the final design to be integrated in the installation we decided to keep the extruder hand cranked. This eliminates electronics that are needed and compensates for a large motor that would be needed for extruding recycled material. We thought that making the extruder vertical would help the flow of material by gravity. Because the crank had to be on ergonomic height the nozzle ended up a bit low. This complicated the catching of the filament because we had to get on our knees to retrieve it and it was less visible from a visitor point of view. Another design flaw was the tolerance on the gears and the auger which causes the auger to grind the inner tube a bit. Horizontal again, and prettier, using acrylic. The acrylic parts are used to fasten it to the installation. A year down the road and some minor adjustments later we gave the extruder an overhaul again, also in the cosmetic sense: we used acrylic that we had previously also used in our printer and shredder. It just looks better. But the functionality was also improved: we put bearings in the auger enclosure to prevent grinding and the orientation was changed back to horizontal to facilitate the catching of filament. Because the flanges of the auger housing were welded this caused some deformation in the metal thereby again creating tolerances on the auger and housing. An idea was to create the flanges from 1 part in order to eliminate the need for welding. Again an automatic version of the extruder. Heating elements instead of wire and an 28Nm (strong) motor at 8rpm. To better know at which temperatures we were extruding we switched to using heating elements (160W). The temperature is measured with a type K sensor (M6 x 12mm). For a constant feed of material we used an 28Nm strong motor at 8rpm. Moving the heating elements more towards the front allowed us to experiment with the effect of heating the sections differently. This wasn't possible with the wire. Although the motor now gave us a nice and constant rpm we noticed that the flaw lay in the homogeneity of the input. If the plastic shreds aren't small enough they don't get transported by the auger immediately. We noticed during our event on 14 Feb that the interaction with the installation is much less when the extruder is automated: then it becomes only a matter of watching the machine. We'll continue to develop the automation of the recycling process in order to create recycled filament spools but for the installation we will focus more on the interaction and feedback part in order to achieve better output when operated by hand.